A worthy classic that ages surprisingly well. Incredibly sharp writing with a true heart and excellent direction from Rob Reiner, as well as near-perfect chemistry between Meg Ryan and Billy Crystal. Comes off as an attempted compromise between Woody Allen and more low-brow romantic comedy. 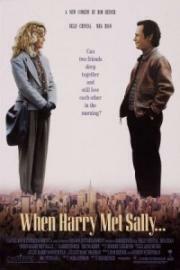 It's occasionally funny and Meg Ryan is mostly okay, but Billy Crystal doesn't pull it off. Principally, the fact that I wanted to watch a romcom must mean that I am in a volatile emotional state anyway. Definitely exacerbated that state, cos, well, ur eating yoghurt or whatever stoned watching When Harry Met Sally... you know, lik, what is my life. More mini-review/status updates to come. Aug 05, 2018 Yasin M.